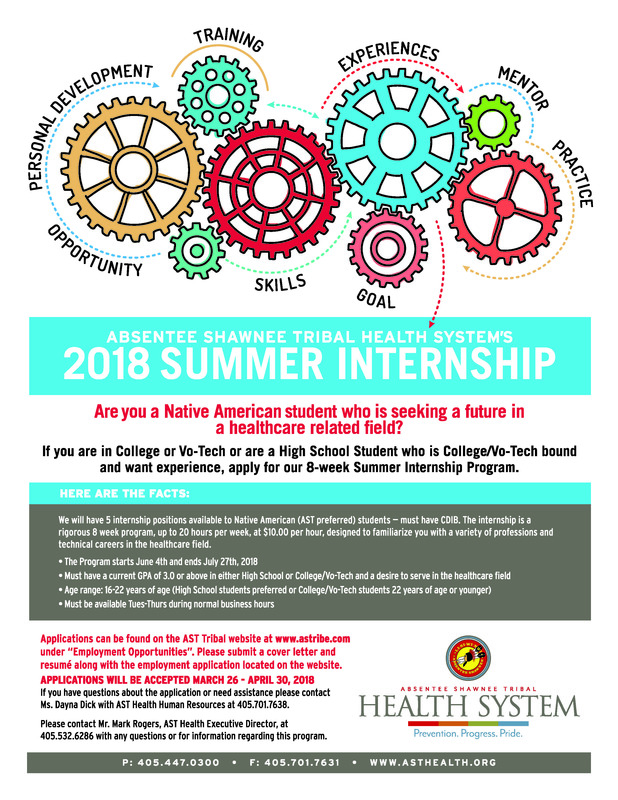 Beginning March 26th, the Absentee Shawnee Tribal Health System will be accepting applications for the 2018 Youth Summer Internship Program. The program introduces participants to the variety of professions and techical careers, in tribal health. The 8-week program is for Native American, high school, college or vo-tech bound students ages 16 to 22 with a GPA of 3.0 or above. Applicants must be available up to 20 hours per week, Tuesday through Thursday during regular business hours. There are 5 positions available beginning June 4-July 27, 2018. Please visit www.astribe.com under the employment tab beginning March 26th for internship application requirements and the deadline for submission is April 30, 2018. For additional information, please call AST Health Human Resources at (405)701-7638.